This page provides basic information and an introduction to Archery. We are obviously very concerned for everybody's safety in the club and the following rules should be followed for all our sakes! Never draw a bow unless you are on the shooting line. Never pull a bow string back and let go without an arrow. Do not shoot until the line captain has blown the whistle. Never cross between the shooting line to go to the target unless the whistle has been blown 3 times by the line captain. When pulling arrows out of the target make sure there is no one behind you to hit in the eye. Always bring back to the line the arrows you shot. The rugby club do not like impaling themselves on lost arrows! If you think there is a danger say so. Better safe than sorry. If you think your equipment may be damaged tell the coach. There has ever only been two serious accidents in archery and we would like to keep it that way! Goes on your arm to stop the string hitting it. Goes on your fingers to help you hold the string. The bit on the end of the arrow that holds it on to the string. The pointed end of the arrow. The place on the string where the nock fits. The part between tthe pile and the fletchings. The feathers on the arrow (often plastic!). 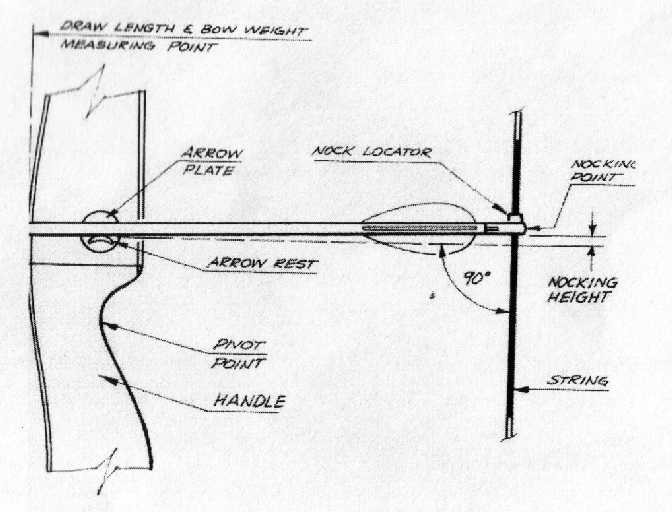 Part of the bow used to aim with. The centre part of the bow with the handle you hold. The top and bottom parts of the bow that bend. The round straw thing that has a target face on it. The coloured face you want to hit. Controls the safe shooting at a club. The position under (or near) the chin of the string hand. Pulling the string back ready to shoot. Letting go of the string. The 'odd' colour fletching that shows which way to put the arrow on the string. If it hurts; something IS wrong - say so! Not everyone hits all the time. When others are shooting remain quiet, especially on the line. Always warm up before and warm down after shooting, just as you would do in any other sport. And do not buy a bow without an experienced archer with you.